Today I thought of doing this post not only because I wanted to share my skin care routine, but also do small reviews and my thoughts on those products. I have mentioned it before also that the products I use are nor high end brands neither very expensive. I even don’t use too many products, so it’ll be a simple post. The reason behind my starting with night first is because my day and night routine are more or less same, night being a bit more elaborate. So, after I return from work I always make it a point to first take off my makeup (as they call it) with a cream cleanser and then wash my face with a face wash. I first start by taking off my eye makeup with Lakme Absolute Bi-phased Makeup Remover. The Lakme one doesn’t specify it as an eye and lip makeup remover as compared to the Maybelline one. Though I didn’t try using it all over my face in the fear of breaking out. Honestly I liked the Maybelline Bi-phased remover better and you get an extra 10 ml for the same price. Lakme remover does the job but I have to spend a little more time, energy and patience. I’ll be going back to the Maybelline one as soon it finishes. Price: Rs 225 for 60 ml. Next step is talking off my face makeup. 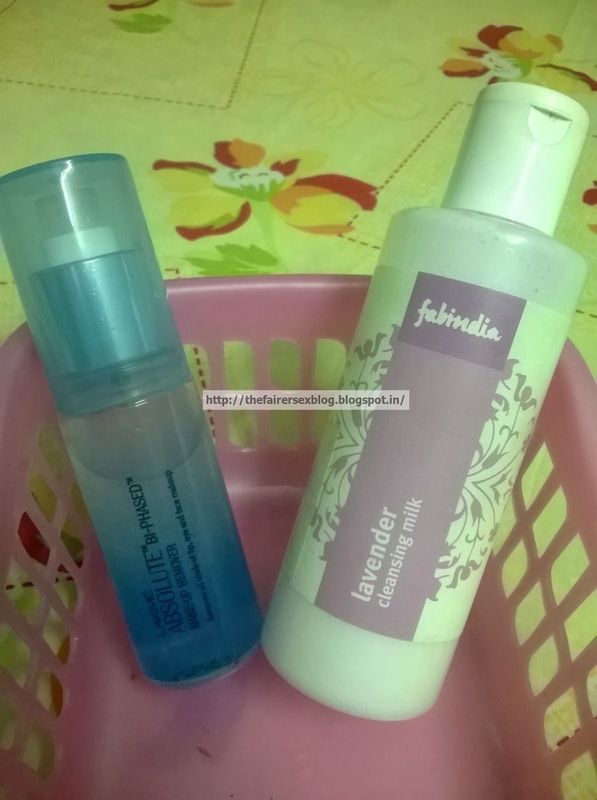 I use the fabindia Lavender Cleansing Milk. It’s a good cleanser. The bottle is bound to last for months. Value for money product. Price: Rs 180 for 200 ml. Next I wash my face with a mixture of Neutregena Deep Clean Foaming Cleanser and Lotus Herbal Oatmeal Yogurt Scrub. The face wash has a thick creamy texture. It claims to control oiliness which it does quite an extent. It doesn’t lather much as compared to its name ‘foaming cleanser’. It does a good job in taking away all the dirt, oil and makeup residue. I have been using this cleanser for couple of weeks. Temperature is already rising and I thought of changing over to a deep cleaning cleanser instead of my moisturizing cleanser (Dove Face wash – blue one) that I was using during the winter. I have a combination skin and this face wash does a decent job and makes my skin squeaky clean. I like this product. Price: Rs. 170 for 100 ml. After this I generally use the Clinique Clarifying Lotion in type 2. This is a fantastic product. Review here. Coming to the last step, Ponds Gold Radiance Precious Youth Serum. I have been using this from the onset of winters. As I mentioned before I have a combination skin and I really don’t need a moisturizer after the serum. This serum has micro gold particles. All you need is just two drops and you are done. This serum imparts a healthy glow as soon as I apply. So far I am loving it. Although not sure of changing it but am also keen to try the Lakme serum. Lets see. Price: Rs 899 for 30 ml. But at times I do use the Clinique Dramatically Different Moisturizing Lotion for a change. Review here. So here end my night regime. 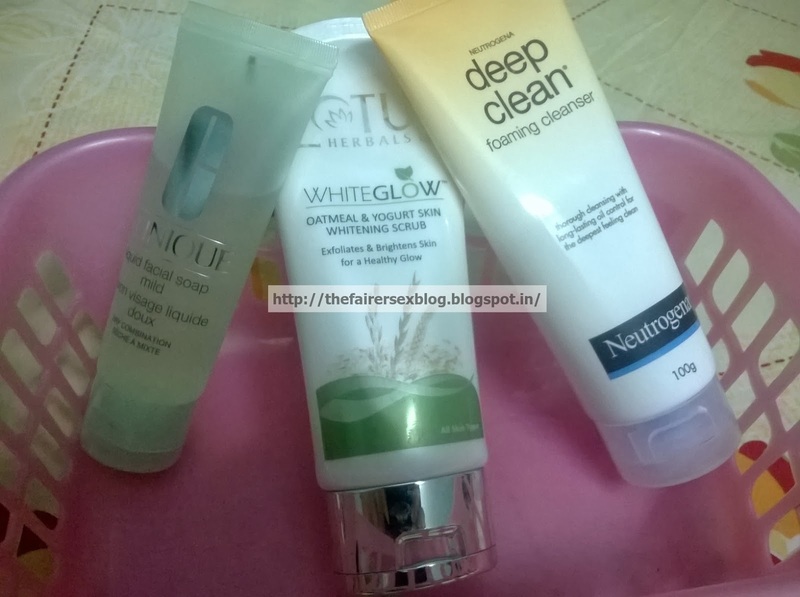 I always wash my face with either the Neutregena Deep Clean Foaming Cleanser or the Clinique Liquid Facial Soap. Full review here. 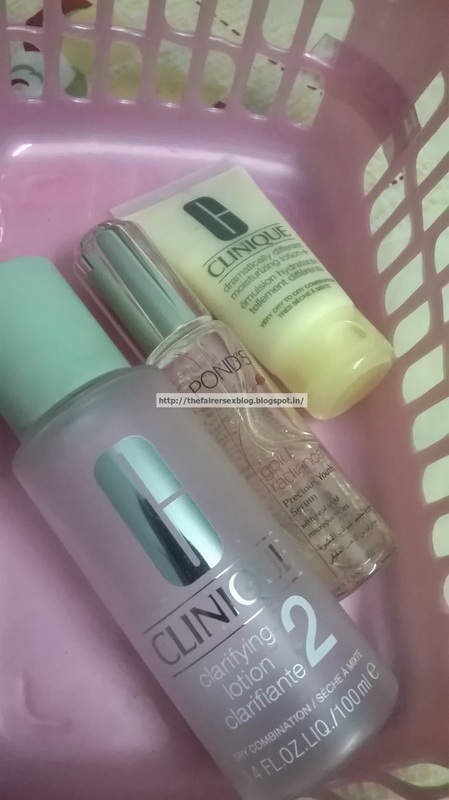 After that I use the Clinique clarifying Lotion and the Ponds Serum and I proceed to do my face makeup. One thing I would like to say is that the Ponds Gold Radiance serum also acts a good primer or base for my makeup. I use face packs once or twice a week. 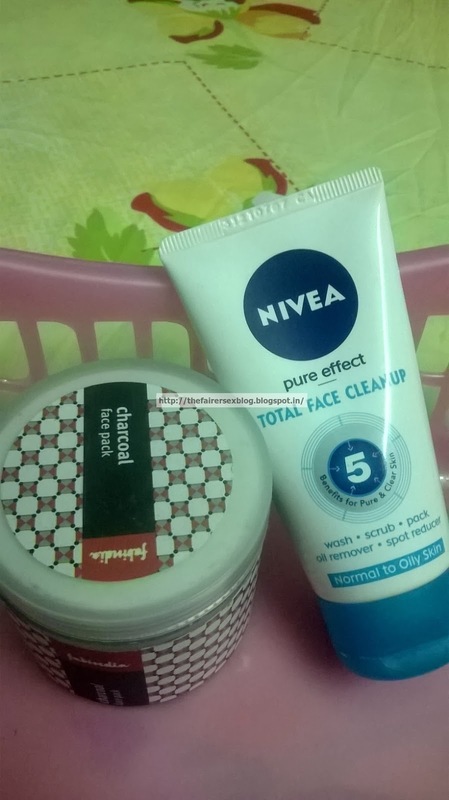 I generally use Nivea Pure Effect Total Face Clean Up once a week. I just layer it on while shampooing my hair (multi tasking :P). I really don’t have an opinion on this mask. I use it just to finish it off. I don’t see or feel any significant change post application. Another face pack I like using is the Fabindia Charcoal Face Pack. So here’s my brief daily skin care routine. What are your Daily Skin Care Routine Products? I would love to hear it from you.